The evaluation of Gesundes Kinzigtal’s work by independent research institutions is coordinated by a separate coordination agency EKIV It was established at the department of medical sociology at Freiburg University. EKIV is managed by Dr. Ulrich Stößel (head of EKIV) and Dr. Achim Siegel, M.P.H. . All outcomes are cross checked by AOK and SVLFG respectively before they are made public. 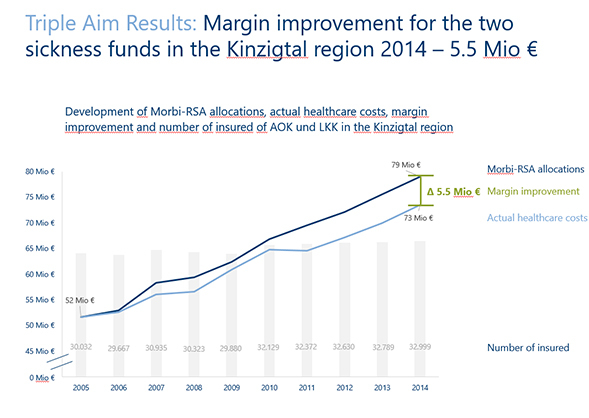 In 2014 new figures lead to an improved contribution margin for 2012 of „146 Euro per AOK-insured person, or 4.6 million Euro for all 31,000 AOK-insured persons in the region in regard to risk adjusted normal costs of care in Germany“. That is, the actual cost of the insured were almost seven percentage points lower than expected costs. (>link) A recent evaluation of the PMV Research Group of the University of Cologne draws positive conclusions as well. The researchers found a declining in over-, under- and misuse of healthcare in many indications in the Kinzigtal region, and at the same time they observed an increase in healthcare quality.